This large, modern and very luxurious home is situated in the center of Noordwijk, a stone's throw away from the North Sea and the dunes. 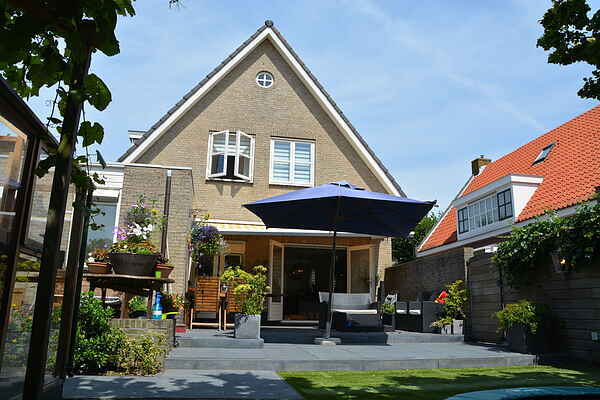 This modern detached house is located in the old center of Noordwijk. The home is furnished with all conveniences and is comfortably decorated for a family of four or five. All facilities are just around the corner and within a few minutes you'll find yourself at the beach of Noordwijk aan Zee. There's plenty of space inside as well as outside, everything you need for a lovely stay is at hand. There is a fireplace in the sitting area and a large jacuzzi in the bathroom. You can use the computer with Wi-Fi connection as well as the gaming system. The gorgeous surroundings of Noordwijk are typified by the dune landscape and the long sandy beaches along the North Sea coast. In the quaint center of Noordwijk you'll find lovely shopping options, a great place to grab a bite to eat or go for a drink. Places such as Den Haag, Wassenaar and Katwijk can easily be reached by car in minutes. In short, you'll enjoy the peace, quiet and nature but should you desire, you can reach Den Haag, the busy center of the political heart of the Netherlands in minutes.